I am definitely not doing my part as an American to keep this number so high. I wish us socialist were in a position EVER to do that. I MEAN EVER. WOW. I WALK MILES FOR MY FOOD. NO WAY I WILL THROW 40% OF ANYTHING AWAY UNLESS I DO SOMETHING TERRIBLY WRONG IN COOKING IT. Maybe food should be regulated. That is a really really shocking number. it makes me very sad to think about personally, and not even for the many starving people. I personally could do some much with 40% of all food I see. Imagine how big my thanks giving feast could be. i would have thousands and thousands of turkeys! That's a lot of walking though. I blame cops and store owners. straight up. People no longer place value on food, why would you when you can just go to the store and get another package? When each family pretty much grew their own food, they knew the hard work that went in to growing it and would never waste it because it was the only food they had. I understand that today the population is mostly living in urban areas but if enough familes grew a portion of their food not only would they be less willing to waste but it is aslo make the families healthier in the long run. The food that is about to expire should go directly to churches, food pantries and soup kitchens, not the dumpster. A few years ago a local restaurant was fined and threatened for giving food to a locally run rescue agency. They also threatened several grocery stores for also donating food. I think there are legislators that go out of their way to make sure we behave the way they think we should. I don't like the idea of too much protection from my government in areas where I can make decisions. I wish they'd do a better job doing their own job. "Reduce, re-use, recycle". I'm going to go into my cabinet and freezer and not buy any more groceries until I use up what I've got. Here I come, canned soup and applesauce. Like my pappy always said "eat every bean and pea on your plate"
Part of the problem is the supply chain by shipping food from all over the country and world eats up most of the shelf life. I've found produce often spoils within days of purchase. It's why I try to go to Whole Foods and farmers markets. The food lasts three or four times longer so less goes to waste. I avoid milk because small containers are expensive and quarts and gallons never get used up before they go bad. Traditionally in Europe and years back in the states people would grocery shop every day. It avoids waste since you buy what you intend to cook that night. The laws need to be changed. We have kids who go hungry and familes who cant afford groceries but the grocery stores are throwing the food away. It is shameful, wasteful and hurtful. On top of that food pantries and kitchens are struggling to make it. Many businesses don't donate unsold products because if someone get sick they'll get sued even if it wasn't there fault. Where do you think that most of the food banks get their stocks from. I sorted vegetables at a local food back that was donated by distributers as well. That's not entirely true. I volunteer at a food bank ever week, and a lot of local grocery stores donate some of their unneeded food to us. 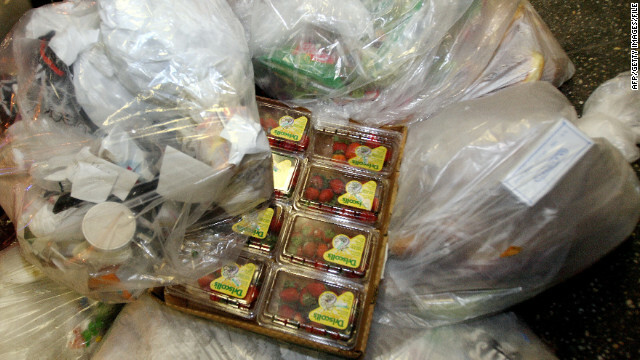 The problem is that this food is often in such bad condition that we have to throw it away anyway. While you have a nice idea in theory, it won't be solved by distributing unhealthy food to the poor. I admire the feelings and passion, on this subject....Now comes Reality....The moment, a plant grows, a cafe is born, a pig is born, a baby robin hatches, it will DIE in some way shape or form and go back to the earth. Its not waste. Gamma irradiate our entire food supply. That would fix most of the waste. II've been to the states. By the looks of things, I don't think much food is being wasted. Well maybe the vegetables. An environmental action group making a report that criticizes everything. Color me surprised. I hear you on that! I've got a family of six, and my kids don't waste a single drop of food! Lol...We can't keep enough in the house. The only good thing about it all is, we hardly have any processed foods in the house, it's mostly fresh fruits and vegetables. So I don't really mind if they eat it all, at least they eat healthy. For what its worth, mother nature intended organic material to rot naturally (and create methane gas) so that the seeds held within the fruit of said plant could reach the soil and propagate the plant in the following growing season. So saying this is a major problem shows a lack of perspective on the author's part. The idea of farmers leaving crops in their fields because the cost of harvesting is greater than the potential income is an event directly correlated to the price of diesel fuel. That is the driving factor in the cost of farming, and when diesel cost less to refine than unleaded gasoline but costs $1 per gallon more... I think we have the root of this problem. Lower petrol costs = lower farmer costs = lower food costs = more opportunity for a wider economic spectrum to eat healthy produce if they so choose. Despite what everyone thinks about Americans, some eat poor quality food by choice many others eat it due to $$$ concerns.